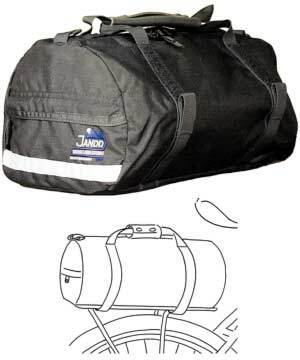 The Duffel Rac Pac is a simple and efficient addition to your bike, perfect for commuting to work or play, excellent as a sleeping bag compartment on your next around-the-world cycling tour. As well constructed as all of our travel duffels, the Duffel Rac Pac has our standard heavy-duty main zipper and flat zippered pocket in the rear, both with generous storm flaps. 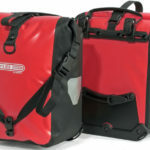 The duffel can easily be carried off the bike by the comfortable leather handle or by an optional shoulder strap attached to two “D” rings at the ends of the bag. A removable HDPE stiffener supports the bottom of the Pac, and a strip of 3M Scotchlite Reflective Material provides after-dark safety, and is sewn to accommodate a clip-on light. 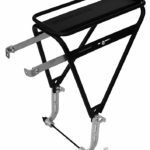 The hook and loop anchor straps that attach the duffel to your bike’s frame also double as a compression system. 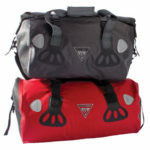 Simply push down on the Pac with one hand and pull each strap tight to compress and stabilize your load.